I was convinced that we had entered what I believed would be a seven to fifteen year bull market in the yellow metal. My reasoning was based on two assumptions. First, I was sure that demand would outstrip supply for decades to come. Gold is finite and every day there is less to mine and all the “easy” gold had in fact been mined. Secondly, I envisioned the US creating more and more debt that could only be financed by the use of the printing press. 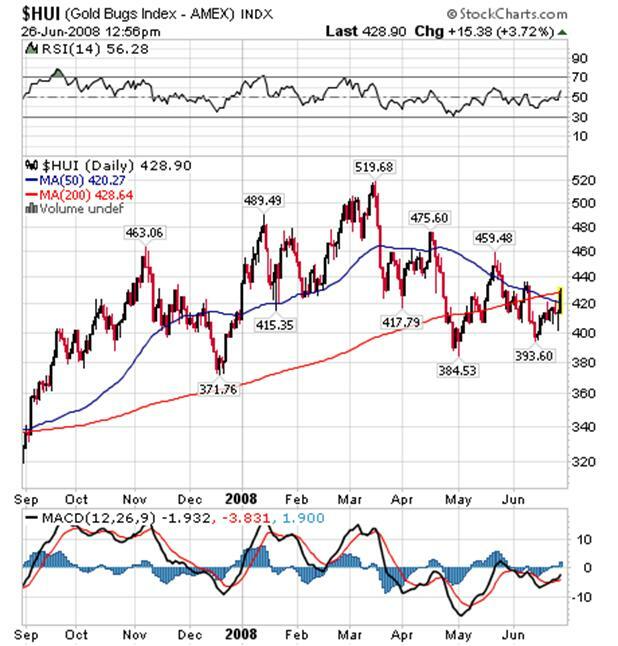 Such behavior is ultimately inflationary and that favors much higher gold prices. To date, I have been right on and I’ve reaped the benefits. So as a result, the so-called “smart money” began to buy gold driving the price up from the $252.00 low, well into the $500’s. Then the institutions began to purchase gold and that drove it up to the recent $1,033.90 peak we saw back on March 17th. April 1st. That was a new all-time high just in case you want to keep records. From there gold began the long awaited correction that would take it down to $811.00, $731.00, or the gates of hell depending on who you listened to. 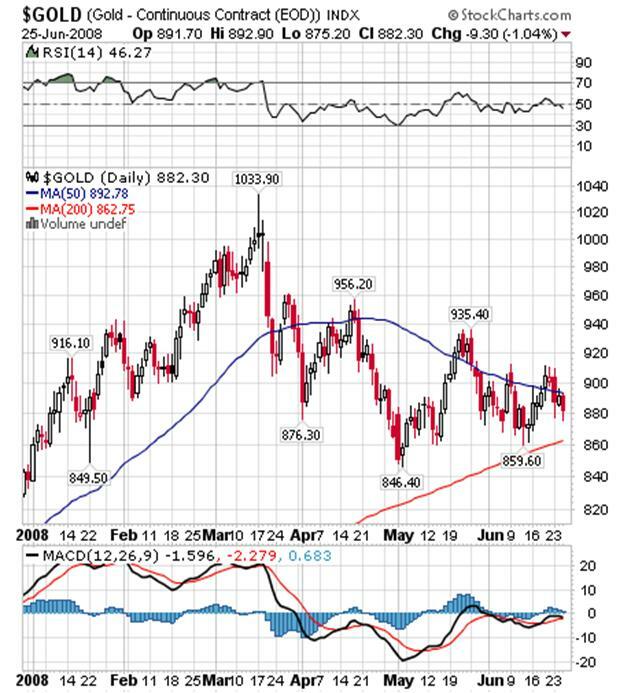 Declines in gold are always scary because they are based on fear, usually unfounded, and that fear leads to violent movements to the downside. Rallies by the way are based on greed and are almost never as volatile as declines. 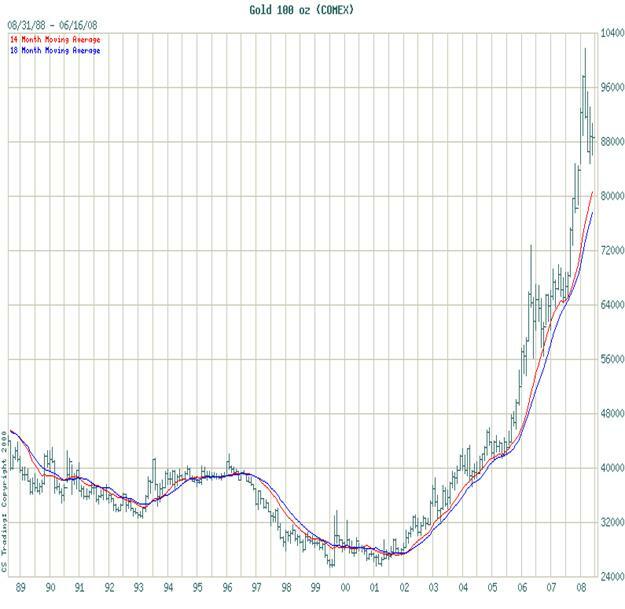 So the gold price headed down with almost no one paying attention to the fact that gold broke out from the old historical (1981) high of $850.00 and that just might be a logical place for any retracement to stop. That is often a common occurrence after a strong leg up and gold certainly had a strong leg up. No sooner said than done! Gold dipped down to 846.40, looked around for a couple of minutes and then headed back up. Since then gold has tried to rally only to meet with persistent sellers on more than one occasion. Many took that as a sign of weakness but unfortunately many do not know what they are talking about. Each selling spree produced a series of higher lows all while each buying spree produced a series of lower highs. Most people seem to go through life unaware of their surroundings and so they failed to realize that we saw this same exact pattern, a series of higher lows and lower highs thereby compressing price, way back in August of last year. And like August of last year, everyone was concerned that price was going to break down and fall to $500. 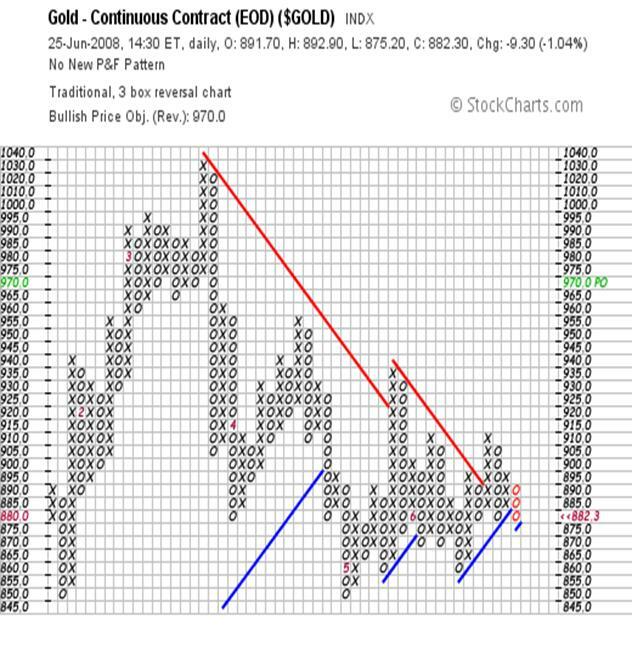 In bull markets a formation whereby price is being compressed stands an 80% chance of breaking out to the upside, and gold is more bullish than the most. Today is no exception to the rule and I am absolutely convinced that gold will do the same thing. In fact, as I type the August gold is up $31.00 at $913, and has in fact broken out to the upside! Just a couple of days ago gold fell $22 in a question of three minutes and that prompted the usual chorus of “we’ll see a lower low in a week”, but they were of course wrong. I told you to buy gold after the break, and again the next day, and time has proven me correct. I didn’t just discover gold and I want you to understand that I am not a “gold bug” meaning I do not have an emotional attachment to gold, or anything else I invest in for that matter. I look at gold as the only true way I can protect or accumulate real wealth and it is the only real store of wealth. I do not fear corrections in gold and I also don’t blow them out of proportion. You need to understand that the numbers say that the correction in gold is over, the correction was a rather shallow 15.5%, and now gold is being accumulated and it will head higher. Much higher! Higher than even the most dyed in the wool gold bug can imagine. Today the August gold closed up $32.50 at $914.80 and clearly broke out to the upside and out of the pattern of compression. The last time gold did that it exploded for almost $100 in twelve sessions. I am convinced that gold is going higher, higher than the P & F target of $970, higher than the $1,033.90 March all-time high, higher than the $1,179 Fibonacci resistance. I see gold trading as high as $1,711 by this time next year and that is the same target I had three months ago. The reason for the rise is not important. What is important is that gold is going higher, as measured in any currency, and if you want to protect your wealth, you’d better own some. If fact, you’d better buy a lot. Then you have the issue of the declining Dow and just how much of a drag it will be on the HUI. With the 50-dma now below the 200-dma, you have a much weaker chart than with gold or silver. My best advice is to use any significant rally in the HUI to get out of gold stocks. Stocks in general are not a good place to be and that won’t change any time soon. Personally, I would not be afraid to buy gold and silver on a weekly or monthly basis because you can’t go wrong over time. Gold stocks don’t give me that same comfort level.